How to Zero Rifle Scopes? 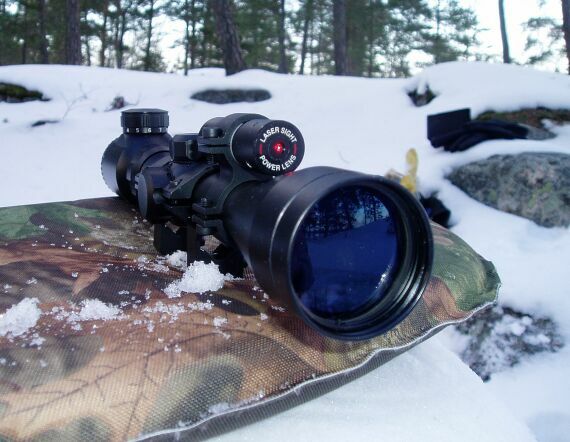 Zeroing a sight or scope means getting the crosshair in position so that when you shoot. Ground zero if you like. The point of impact. There's a lot of discussion amongst shooters on the best way to zero a scope or sight. What I've written below is what I've been sending out to my ebay scope buyers for the last year or so and received a lot of good comments back about it so I know it's OK! Position the eyepiece by sliding the scope back and forwards. You may have to move one or both rings to get this right. Position the rings so the scopes eyepiece will be the correct distance from your shooting eye when the gun is held naturally. This is usually between 2 and 3 inches from the eyepiece lens, but it is the spot at which the image in the scope appears as full and bright as it gets. To see what this looks like, move your head back and forth along the stock, as you look through the scope with both eyes open. Then, position your head on the cheek piece where you want it to be and move the scope back and forth until the image appears bright and full. Make sure the windage and elevation turrets are positioned correctly - Elevation (up and down cross-hair adjustment) on top and windage (left and right movement) to the right. Now align the vertical cross-hair with both eyes open and the gun held naturally to your shoulder. Rotate the scope until the vertical reticle seems to bisect the gun perfectly. Now it's time to tighten the top cap rings. You need to take this carefully and slowly as it's a critical step. It's not hard, just be patient. Tighten each screw partially, then move to the next one and go around the pattern of screws many times, rather than tightening each screw all the way on the first try. You will put even tension on the caps and be less likely to dent the scope tube this way. If there are two screws on the side of the ring, tighten only one, then tighten the one on the opposite corner of the other side of the cap (see graphic below). Leave the other two screws for the moment and tighten two screws on the other ring next. Then come back to mount one and tighten the two screws you left loose. Then back to the other ring and keep rotating until the scope is secure. It takes less tightening that you might think. They need be firm not as tight as possible. Err on the side of too loose, rather than too tight. This is the order of screw tighten in the case of a double screw mount. 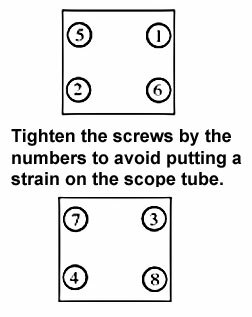 If you have a single screw each side then do it as 1 - 4 - 5 - 8 (you get my drift I hope) basically you want pressure to be as even as possible throughout the process and not risk damaging the tube of having uneven pressure on one side that will make zeroing more difficult. Now that your scope is set up it's time to have some fun and shoot a bit.